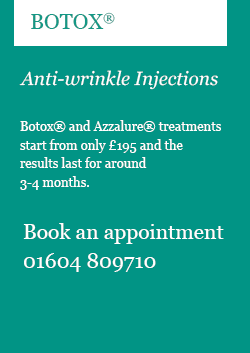 At Cliftonville Dental we treat facial wrinkles with Botox and Azzalure injections, which may be provided to patients following a consultation. If you are unhappy with lines and wrinkles on your forehead, between your eyebrows (known as glabella lines) or your crow’s feet, then please book a consultation with us. We also use Botox® and Azzalure® to treat gummy smiles; when injected into the upper lip muscles these products decrease the amount of gum shown when the patient smiles. Botox® and Azzalure® are trade names for Botulinum Toxin Type A, a neurotoxin that is administered by a tiny injection to stop your nerves from sending messages to activate the muscle, without loss of feeling in the muscle. Please call for more information or complete the enquiry form below. We’ll assess your medical history, make an examination of your facial muscles, take photographs and discuss your expectations. Botox® injections take 10 to 20 minutes to administer, depending on the amount required. The injections are no more painful than an insect bite or pinprick, and normal activity can be resumed immediately, although strenuous activity should be avoided for 24 hours after treatment. It may take several days to feel the full benefits of the treatment, but the effects last three to four months. What can Botox® and Azzalure® be used for? Will my face appear frozen? No. It’s our job to help people who want to soften or eradicate their wrinkles and we do this by, where appropriate, targeting the unattractive lines, while enhancing the natural features of the face. Botox® and Azzalure® help reduce wrinkles that appear as a result of movement; it can therefore widen the eye and give a well-rested look. You won’t look 20 years younger, but you may find you look more natural and relaxed or less sad and angry. The injections are no more painful than an insect bite or pinprick. There may be mild temporary bruising, numbness, or redness around the injection sites. Botulinum Toxin Type A is a neurotoxin in the form of a purified protein and it is injected into muscles to block the transmitters between the motor nerves. Once the motor nerve endings are interrupted, the muscle cannot contract. There is no loss of feeling in the muscles. In rare cases patients may experience one or more of the following: headache, temporary blurred vision, temporary eye-lid droop, nausea, pain, redness at the spot of injection, muscle weakness. Are Botox® and Azzalure® suitable for everyone? No. A consultation is required and they are just two of many possible treatments that may be recommended. They are not suitable for pregnant and lactating women and cannot be used in conjunction with some other medications. The effects last for three to four months and it takes up to two weeks to see the full results. With repeated treatments three or four times a year the effects of each treatment may start to last longer, in some cases for up to six months.